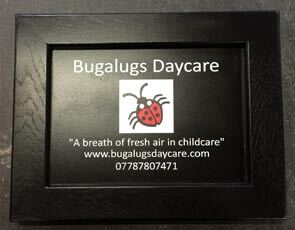 These really are top quality wooden framed signs and they are designed to last. They feel really solid and have a substantial weight to them. The style is very traditional but we do use the latest panel material and paint system, along with a painted oak or accoya wood frame. We now recommend using accoya wood as the paint will last up to three times longer than oak. The inner panel is made from Tricoya board. This is a wood based board made using a high performance resin. It is very stable, strong, durable and weatherproof. Tricoya itself comes with a 50 year guarantee. On top of that it is environmentally friendly. The outer frame and inner panel are spray painted using is a two component polyurethane paint which is much more durable than standard brush-on paints. It is not only much tougher and longer lasting, but is also more resilient to chemicals. 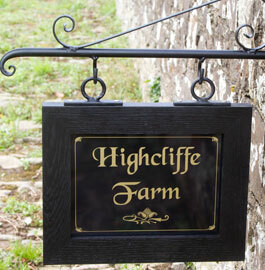 As standard we paint the signs Black, White, Farrow & Ball Purbeck Stone and Lichen. Other stock colours are £5 . Click here to see stock colours Color Match @ £55 per colour per order. We can match most Farrow & Ball colours. 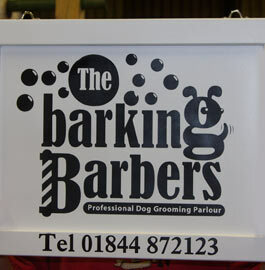 Lettering can be as small as 20mm and the cost includes up to 50 letters. Extra letters are £1.65 per 25. We have a large selection of fonts to choose from - click here. 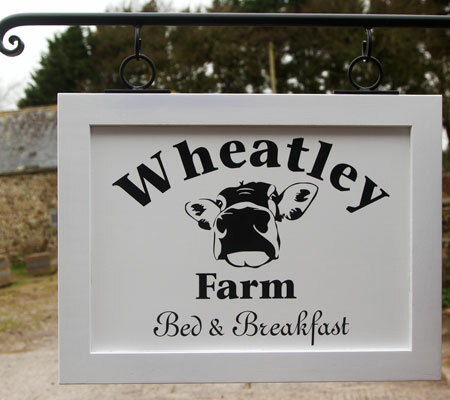 We can even paint lettering on the wooden frame. Prices for standard sizes are shown below. However as these are made in our workshops we can quote for any size. Normally the whole sign is painted in one colour with the lettering in another colour. Extra colours - £15 for most signs. Also the case if the frame and background colour are different. 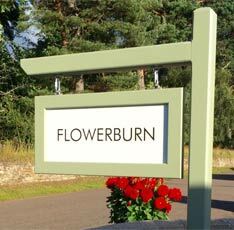 If you want a similar sign but at a cheaper price, take a look at Wooden Framed Aluminium Composite Signs with Vinyl Lettering or we also have Painted Sign Boards without frames. Made in the UK. 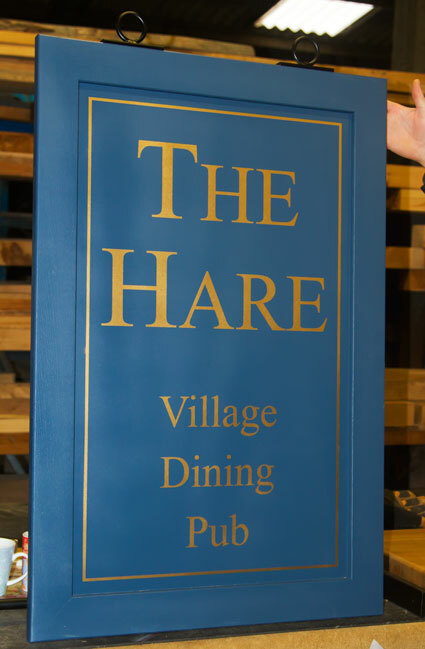 Our team at The Sign Maker looks forward to helping you with your oak framed sign.